Continuing with copies of the lantern slides described in Update No. 40, the above photograph depicts the location in Devonshire Hill Lane now crossed by the Cambridge Road (A 10). The view looks westwards towards River House and the area remained undeveloped when Samuel South(2) and his family moved to the property in 1917. Further scrutiny of the photographs published in Update No. 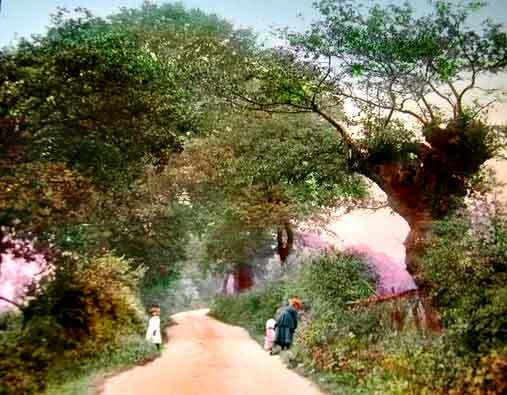 40 suggests that the image entitled "New River in the grounds of River House, Devonshire Hill Lane, 1905", has been wrongly ascribed. The scene illustrated is, in fact, a view of the lake in the grounds of Tottenham Park, which is now the site of the Garden of Rest adjoining Tottenham Cemetery. The rural environment around Devonshire Hill Lane disappeared as a result the housing developments undertaken by the Tottenham District Council during the 1920's. The following article by Ken Barker was published in the Spring edition of the "Voice", the newsletter of the Harringey Local History Forum and is reproduced with their kind permission. The Housing Developments by Tottenham Council, mentioned in the article by John Hinshelwood in the Winter edition of the "The Voice", included an estate built on one of the last rural areas of the district. Up to the 1920s, the area north of White Hart Lane from the site of Rectory Farm, close to the present day Garden of Rest, was a landscape of fields with few houses. Devonshire Hill Lane wound its narrow, tree-lined way northwards for half a mile from White Hart Lane, terminating at Devonshire Hill Farm. "This land ['Land at the extreme north-west corner of he District North and South of Devonshire Parade, including land at the rear of and adjoining Rectory Farm'] offers to the Town Planning artist a finer opportunity than any other vacant land in the district. It is of good elevation, The Parish boundary is the natural watershed, and the whole of it has a gentle slope to the south. Its, extent, moreover, is sufficient to permit of a good scheme being made and there are no existing buildings of any consequence to be acquired or retained. Sewerage connections of good depth exist in Creighton Road and Devonshire Parade. Communication is, however, limited to White Hart Lane Station and the trams in the High Road. The area of land is shown on the plan sent herewith. The number of houses proposed to the acre being 12. The Owners of this estate are the Ecclesiastical Commissioners, the London County Council and Mr. S South"
The report was accepted and the proposed housing development, designated Housing Scheme No. 1, sanctioned by the Government. Negotiations were entered and some 60 acres at a total cost of £23,000 were purchased from the various owners of the land. A second, smaller, development was instigated at Coombes Croft. Representatives of Tottenham Council attended an International Housing Conference held in London in 1920 at which resolutions were passed recommending minimum standards for Public Housing. Delegates attended from 30 countries, including, surprisingly, Greenland, India, Burma and the Gold Coast! Visits also were made to inspect the types of housing built by other Local Authorities. Fortunately for the future residents of the proposed Tottenham Estate, the design for a concrete house with a metal staircase was rejected, as was an experimental house constructed with 18" walls of "rammed earth". Attempts to emulate the latter method of construction using the clay soil of North London would have been interesting. Tenders for the construction of 400 houses (excluding materials), and, separately, for the roads and sewers, were invited. Both contracts were awarded to the Metropolitan Tunnel and Public Works Co. Ltd. The cost of each house, labour and materials, was estimated at £955 and £857 dependant upon the design. Building work commenced in 1920. At the same time, the wider area around White Hart Lane was being extensively developed; the London County Council estate to the south was being extended; and, Middlesex County Council were responsible for supervising the construction of the Great Cambridge Arterial Road (A 10), which bisected Devonshire Hill Lane. The lay-out of the estate, utilising about half of the purchased land, included Cavell Road, Jellicoe Road, Fryatt Road, Laburnum Avenue, Acacia Avenue, Weir Hall Avenue, Oak Avenue and Barkham Road. All of these roads were to the east of the new Cambridge Road. Tottenham Councillors paid close attention to the details of the design and fittings of the houses being built on their estate. The height of ceilings was increased, gas mantels, kitchen stoves and wardrobes were inspected for approval and house number plates selected. After the building works started, because of a worsening of the economic situation, the Government instructed the Council to reduce the number of houses to be built from 400 to 296. This reduction resulted in disputes with the Contractors for the early termination of their contract and, also, the Architects in respect of their fees. Both disputes were resolved by negotiation and without resort to litigation. In the event, Government approval was obtained subsequently to erect the remaining 104 houses (Housing Scheme No.2) and, later, for further housing (Housing Scheme Nos. 3 and 4) on the remainder of the land, to the west of the new Arterial Road, that had been acquired for development. Once again, close attention was paid to the lay-out and many of the houses were set around grassed squares. By the end of the decade, the fields around White Hart Lane and Devonshire Hill Lane had disappeared beneath 762 houses, 25 flats, 25 shops, 8 garages, Public Library, Primary School and the Great Cambridge Road. The Harringey Local History Forum can be conacted on 020 8808 2543 or by writing to PO Box 25687, London, N17 6FW. "Ernie" Short, husband of Gladys (1906-2001), passed away on the 23rd April, 2004, a few weeks from his 101st birthday. Much respected, the memorial service held in his memory on 5th May was well attended by friends and family.